Special thanks to Keith Bohn for contribution of numerous documents and his article “Notes on Dating a Parks Planer” which was the seed for this effort, Keith Rucker, Jeff Traeger, Robert Vaughan and many others for much assistance in developing this article. Early 1980’s Parks’ literature stated that over 50,000 12” planers were in use in shops all over the world and I would submit that many of those planers are still in use today. 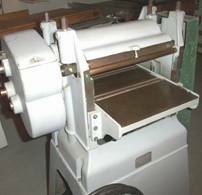 Some of us who own one of these planers would like to know how old our planer is, or in other words when it was manufactured. After purchasing a Parks planer in late 2003, I became somewhat obsessed with finding out how old my planer was. Unfortunately, to my knowledge, a chart correlating serial numbers to date of manufacture does not exist for Parks’ machines. So, with the help of several other OWWM members, I began the quest to find out. 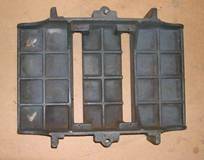 Informally, we noted early on that there were a few obvious differences in some planers, such as changes in the gear box cover from three humps to one hump. After staring at lots of catalogs and photos I began to make a list of differences. From there I developed a survey to collect information from Parks’ owners regarding specifics of their planers. The purpose is to gather enough information to establish a correlation between serial numbers, changes or variations in the planers and a time line. Thus we would be able to establish the date of manufacture or at least approximate it. That survey follows this article. First, a little bit of history. 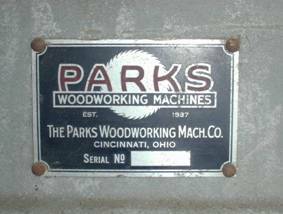 Parks 12” planers were manufactured as early as late 1936, or perhaps slightly earlier, until 1989 when Parks Woodworking Machines went out of business. 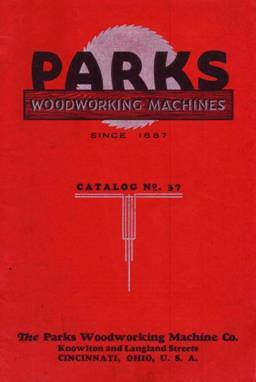 Our first evidence, in print, of the 12” planer is its inclusion in an undated Parks Catalog No. 37, which we think was published on or about 1937. 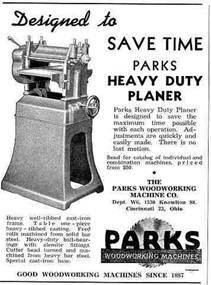 Next, we have an undated Parks Heavy Duty 12” Planer brochure that includes a copy of a letter dated Nov. 1, 1938, from a satisfied customer stating that they “have had the planer in constant use for the past two years.” That would place manufacture as early as late 1936. 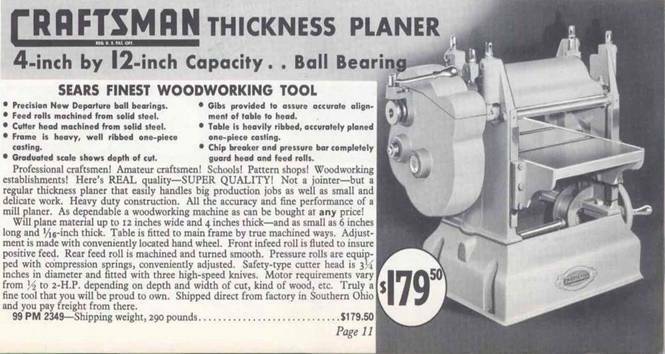 To further place the origin of the planer in the late 30’s, we know that Sears included the planer in its 1938 catalog. 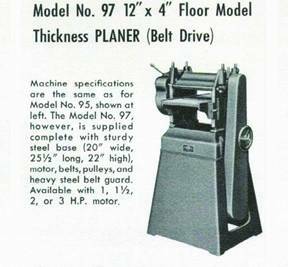 Sears continued selling the planer through 1959. 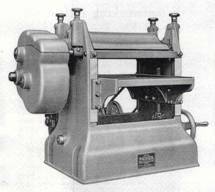 In the 1960 Sears catalog the Parks planer was replaced by the Belsaw planer-moulder. Although the Sears catalogs have been a helpful resource, one problem with using Sears Catalogs to identify changes is that there were no catalogs produced for the years 1944-1947 due to WWII. So when something shows up in the 1948 catalog it actually could have been several years earlier. Mechanically, it appears that there were no differences between the Parks and the Craftsman planers. Cosmetically, the only differences between the Parks and the Craftsman appear to be that Craftsman Planers had Craftsman logo and model number tags rather than Parks tags, and the Craftsman Planers were painted a bluish grey rather than the plain grey of the Parks. 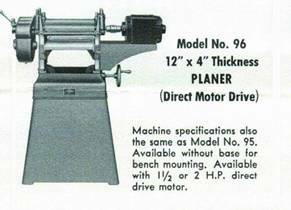 Also, the Craftsman planer only came in the basic model, without a stand or motor (same as a Parks Model 95). In 1956 Sears began offering a 12 gauge steel stand and belt guard as options. 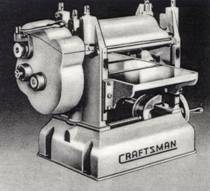 With those two options the Craftsman planer would be identical to a Parks Model 97. There were six model versions of the Parks planer. The No. 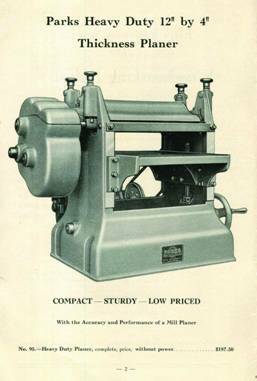 37 Catalog shows only the Model 95, the basic bench-top planer without motor or stand. 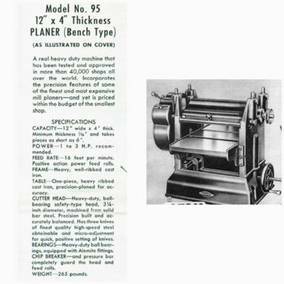 The c. 1938 Parks Heavy Duty Planer brochure includes the 95, the 96 which is a direct drive version, and the 97 which is a 95 with a stand and motor, later to include a belt cover. 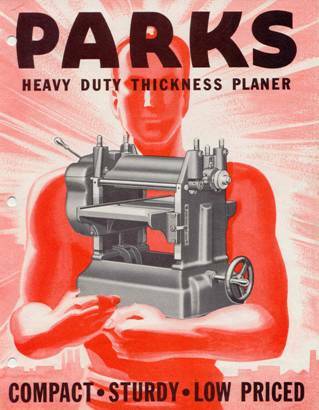 A 1952 Parks Planer-Jointer brochure and parts list includes the 95, 96, 97 and the Models 10 & 11. The Model 10 is the planer-jointer combination machine and the Model 11 is the same with a stand and motor. The 10 & 11 may have shown up earlier than 1952; that is just the first printed evidence I have uncovered. 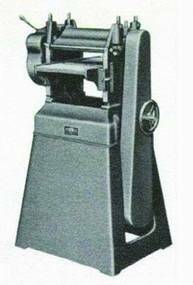 And finally the Model 98, a belt driven planer with a rear mounted motor appeared in a 1984 Parks catalog. 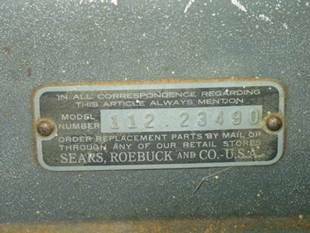 There were/are at least four different model numbers for the Sears badged planers: 112.1801, 112.1901, 112.23490 & 112.23491. I have yet to establish a reason for the three distinct numbers. The 112.1801 model was the earliest followed by 112.1901 then 112.23490 and 112.23491 was the final model. At some point we may be able to establish a correlation between the model numbers and time or changes in the machine, but a correlation is not evident at this time. 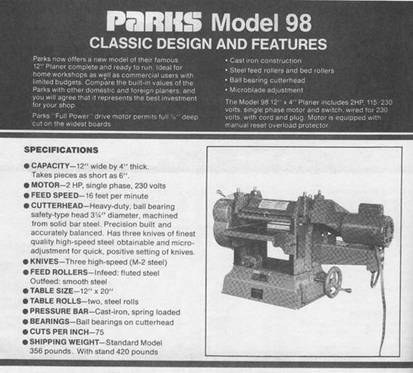 The Parks Model 97 Planer was sold with three different stands as time evolved. The first stand was a very graceful cast iron stand with sides that flared out toward the bottom. Later the planers had a cast iron stand with straight sides that sloped out towards the bottom. Later stands were also sloped and straight sided but made of fabricated sheet steel. 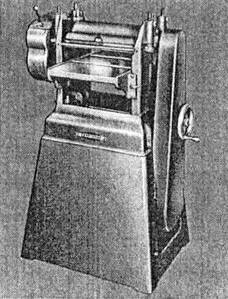 Sears offered the fabricated sheet steel stand beginning in 1956 according to their catalogs. Here are the items/changes identified so far from studying Parks catalogs, brochures, parts diagrams and lists, Sears & Craftsman Catalogs as well as 20 or so surveys submitted by Parks owners. In Parks Catalog No. 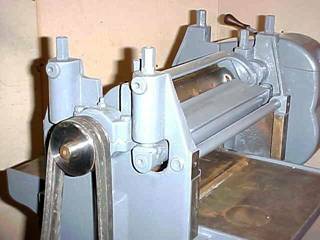 37 the main frame of the planer consisted of a single casting, there was no throw out lever on the gearbox and there were what appeared to be hand knobs on the top of the roll bearing studs instead of the familiar tall looking hex nuts. The gearbox cover appeared to sit on, or as I soon learned, snapped on to the gearbox. Also notable was that the table raising shaft went through the left side of the base casting and was secured with a collar on the outside. 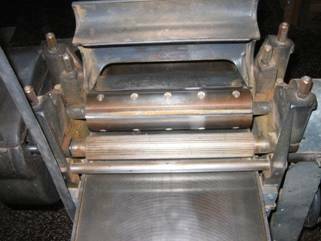 There was also a flat steel bar bolted to the front of the two side castings in front of the in-feed roller. I note those items because changes soon appeared regarding them. As you will note from the above pictures, several major changes are apparent in the 1938 Sears Catalog photo. The frame is now clearly consists of three separate castings – two sides and a base. Although we do not know the reason for that change, we can guess that it was done because it was easier and perhaps cheaper to cast the three separate pieces than one very complicated casting. 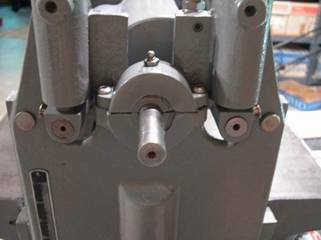 The gearbox now came with a throw out lever to disengage the feed rollers. 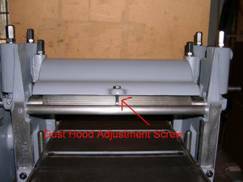 The table raising shaft no longer penetrated the left side of the base casting and the flat bar in front of the in-feed roller was gone. 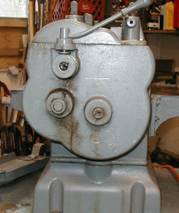 We know that the gearbox itself was originally cast iron, but at some point fairly early in its history (approximately at serial number 5900) it was changed to cast aluminum, probably because the weight of the CI gearbox caused excessive wear of the gearbox where it hangs off the cutter head shaft. We have identified three versions of the gearbox cover. The original snap-on cover, as seen in the above picture in Catalog No. 37, was used only on the very early gearboxes. 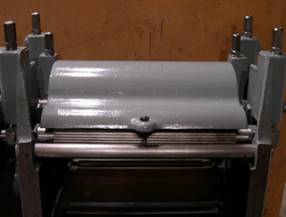 It appears the multi-hump cover changed to a single hump cover sometime around serial number 16500 or in the mid-1950's. 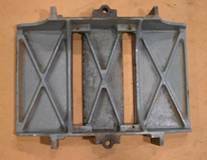 I have heard one or two reports of a cast aluminum gearbox cover, but have not confirmed that an aluminum cover was ever made. There are at least three variations of the base casting seen in early art work. The original around 1936, a second appeared in the Parks Catalog No. 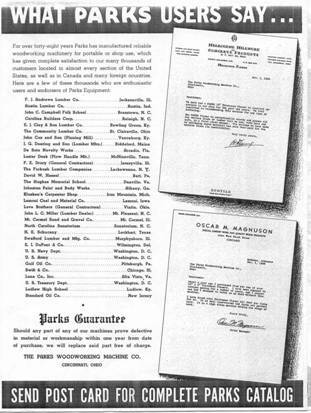 37 as well as the 1938 Sears Catalog, when the sides and base were separate castings and the table raising shaft no longer went through the base casting on the left side, and another by 1948 based upon the 1948 Sears Catalog, where there were additional changes in the same area of the base casting. Interestingly, I have not documented any of these planers with any base other than the final one. So much for using artwork as a guide to reality. At some point the table casting was revised. The change is not evident from the top of the table. On the underside of the table the pattern of the reinforcing ribs changed from a waffle or grid pattern to an “X” pattern. 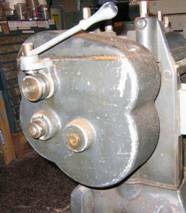 The earliest planer I have documented had a dust hood that bolted on and was not hinged. It soon was replaced with a hinged hood with an adjustment screw. The earliest of the hinged dust hoods had a square nose where the adjustment screw was. That quickly changed to a rounded nose. 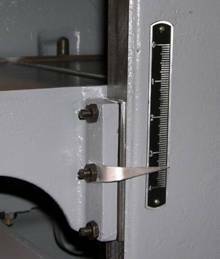 By 1957 the cutterhead had been modified to include jack screws to improve adjusting the knives. 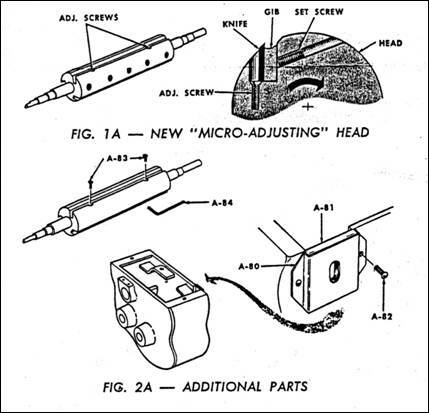 The first evidence we have of that is it being noted in the 1957 Sears Catalog that the "planer now has cutter heads with jack screws for micro adjustment." 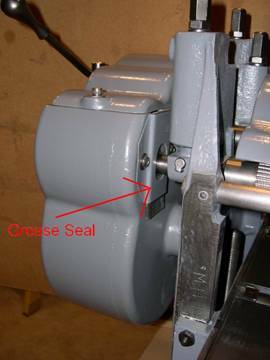 That may also be the time when the gearbox got a grease seal at the in-feed roll. 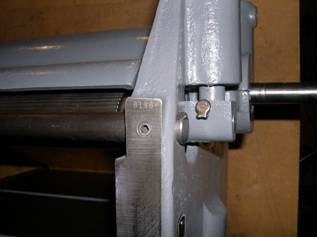 At some point the table roll bearings were improved to include bronze sleeves. Of the two (1949 & 1980) parts lists that I have, neither shows the bronze sleeves, yet they show up on the current parts list of D. C. Morrison Co. I happen to have seen both versions so I know they exist. There are at least two variations of the depth of cut pointer – a bent steel wire or rod version and a bent flat aluminum version. At this point we don’t have enough information to know if the pointer is significant in the time line. 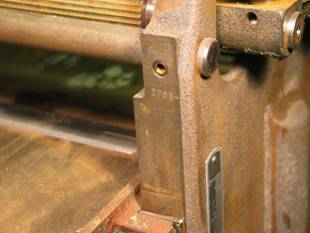 However, based on a limited number of planers surveyed to date it appears that the steel pointers were used on early machines, to approximately serial number 6600. 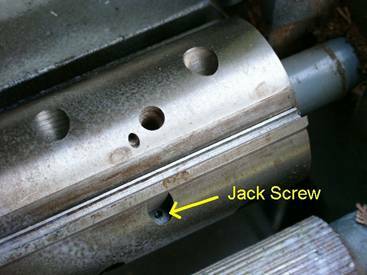 The table gib screws and lock nuts have several variations as do the hex adjustment nuts on the roll bearing and pressure bar studs. 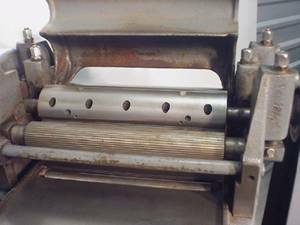 With a limited amount of data, it appears that earlier planers had 1” tall hex nuts and later machines (those with serial numbers approx. 30,000 and higher) had shorter (5/8”) hex nuts. 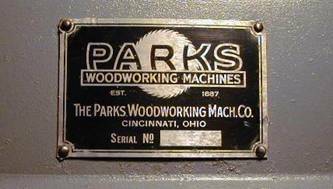 There are several variations in the badging (logo and model number tags) of the Craftsman planers and of the Parks planers. Parks nameplates were typically a 2” x 4” aluminum tag with red and black on silver, or black on silver. Some planers have a metallic sticker of the same size instead of an aluminum tag. So far, when we have seen the metallic sticker it included the serial number stamped on it. It appears that the metallic stickers may have arrived at approximately the same time as the short hex nuts, at about serial number 30,000. 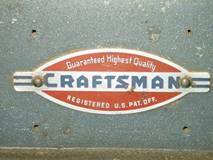 Sears badged planers typically had a Craftsman logo tag and a Sears model number tag. Early Craftsman badge planers had the logo tag on the top of the planer and then the model number tag would be found on the front of the planer. It appears that at the time of the change in model numbers from 112.1901 to 112.23490 the Craftsman logo tag was moved to the front base and the model number tag to the rear of the base. There were two years (1942 & 43) in which the Sears Catalog showed the planer without a logo plate, but it sported the word CRAFTSMAN in large painted block letters on the front of the base and the model number tag was on the rear of the base. I have not documented and such planers. Metallic Parks Sticker w/ Serial No. 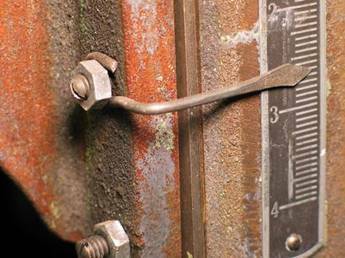 Serial numbers can usually be found on the upper front machined face of the right side casting on both the Parks and Craftsman planers. 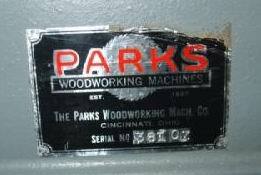 However, some Parks badged planers had the serial number stamped on the Parks nameplate or a metallic sticker and not in the frame. We have noted quite a few planers without serial numbers, almost all of these are very early planers. Somewhere in the life of the planer the cutter head bearing caps were strengthened by thickening the ears on the cap. Although the above information begins to document changes vs time in an overall sense, to further define a timeline we need to acquire information on many more planers You can help us by submitting information about your planer(s) or others that you may have access to.